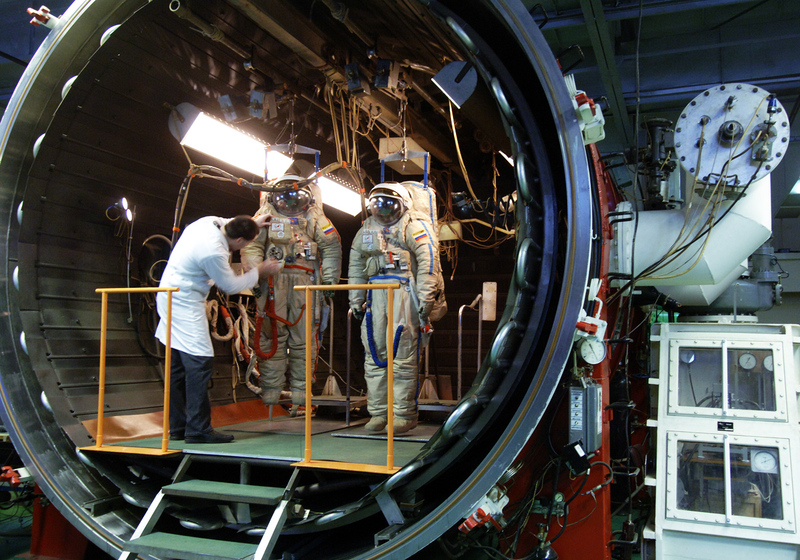 TBK-50 (thermal environment simulation chamber with a capacity of 50 cubic meters) used at the Zvezda research-and-production enterprise for training cosmonauts and astronauts and testing space suits. Many professions today deal with space industries. Russia, which was the first country to send a man to outer space, has many universities to prepare specialists for space research. Russia’s most famous and prestigious Russian university, Lomonosov Moscow State University, (MSU), has joined the ranks of higher education institutions where one can obtain credentials for space professions. On Jan. 25, MSU opened the Department of Space Research, which will prepare specialists for vital fields related to the study and conquest of space. "These fields are space medicine, biology, the preparation of cosmonauts for flight and living in zero gravity," said MSU Rector, Victor Sadovnichy, during a board of trustees meeting. "They deal with studying various and unexplained phenomenon in space, with information technologies, and also with the construction of new equipment and instruments." The world’s first human space traveler, Yuri Gagarin, was chosen out of 200,000 contenders. Much has changed since Gagarin's time and today basically anyone has a chance to work in the space industry. This does not necessarily mean flying to space. There are other professions besides cosmonautics that are in demand in the space industry. "Space is an area where many professional skills and various knowledge can find utilization," said Irina Storozheva, director of public relations at the Moscow Aviation Institute (MAI). "Selecting a university with a strong space background and close ties to the industry can help you dive into the profession in your first year of studies, without having to wait for graduation." A university applicant in any recognized engineering university, such as Bauman or MAI, will do. It’s important to have a strong educational foundation to work in space. "The space profession needs mathematic and IT specialists, thermal engineers, material scientists, constructors and production managers, and many other types of specialists," said Storozheva. Of all the space professions that one can obtain in Russia, which will be in demand in the future? Dmitri Sudakov, director of the Atlas of New Professions project, suggests that when selecting a profession it’s important to think of the future, and imagine one’s place in it. "Ask yourself - In which type of company would I like to work? Does this company exist today or will I have to create it?' If the company exists, one can write it a letter with the question, 'I’d like to work for you in the future. Which university should I attend?" Employers need specialists who are developing new technologies and achieving results. "There are project management, computation and technological professions, and such people will always be in demand," said Storozheva. "Engineering professionals are also always needed, and the more complex the technology or task, the higher the demand for a quality specialist." Some trends in the space industry are already clear; for example, the development of commercial cosmonautics will lead to the appearance of new professions, say many specialists. "It's no longer enough for an innovative engineer to just create a product or know how to increase the effectiveness of production technology,’’ said Storozheva. "He must also be an entrepreneur who sees future markets, a systems engineer who manages the product's lifecycle, an organizer of the production process and an accountant who can calculate the cost of his invention." Concerning future professions, the Atlas of New Professions lists space tourism manager, someone who develops programs for visiting near Earth space; and also space transport enginner, someone who will service the near Earth space transportation network and who will develop transportation corridors and coordinate launches from Earth. "Space is the future, and if a university student chooses this industry, it’s a great decision," Storozheva concluded.